A couple of years ago, I reported on a robotic bee being developed at Harvard. The team there had shrunk the tiny bot down smaller than a paperclip, and given it the ability to navigate through water, but there was a problem – it couldn't get back up into the air again. Recently, however, the team has made a breakthrough that allows the robot to once again take flight. The microrobot, which weighs less than a gram, has been equipped with floating devices that enable it to stabilize on the water's surface before an internal combustion system shoots it back into the air. “We designed new mechanisms that allow the vehicle to directly transition from water to air, something that is beyond what nature can achieve in the insect world," said Yufeng Chen, who was a graduate student at the Microrobotics Lab at Harvard's John A. Paulson School of Engineering and Applied Sciences when the research was conducted. The mechanism is reasonably simple. The robot has a central gas collection chamber with a electrolytic plate that converts water into oxyhydrogen - a combustible fuel. To take off, all it has to do is ignite that fuel and ride the resulting tiny explosion into the air. 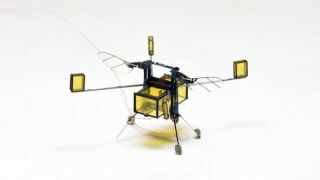 “Because the RoboBee has a limited payload capacity, it cannot carry its own fuel, so we had to come up with a creative solution to exploit resources from the environment,” said Elizabeth Farrell Helbling, graduate student in the Microrobotics Lab and co-author of a paper describing the technology published in Science Robotics. To fit the gas chamber, plates, sparker and floats onto the robot, it had to be redesigned to be able to lift more than three times the payload of the original RoboBee. It now weighs about 0.18 grams, almost twice the previous design. The only limitation at the moment is that a lack of on-board sensors means that the RoboBee can't fly immediately after jumping out of the water. The team aims to fix that with future research. "We hope that our work investigating trade-offs like weight and surface tension can inspire future multi-functional microrobots – ones that can move on complex terrains and perform a variety of tasks," said Chen.